Around this time every year, I weed through my closet and pull out all the winter pieces that are clogging up my shelves and hanger rods. After all of those pieces are cleared out and I can now see all my spring and summer pieces, it’s time to figure out a few new pieces to add to refresh my closet for the coming season. I hopped on Zappos.com picked up a few new spring pieces. Zappos has been one of my go-to’s for shopping for years because they have such a huge variety of brands, and nothing compares to their free and crazy fast shipping, 365-day returns, and incredible customer service. That’s why I keep coming back over and over! I found so many good pieces, but these are the ones I landed on that are perfect for refreshing your wardrobe for spring. First, a pretty pair of flats. During the spring, I live in flats. These Seychelles ones are such a soft, pretty blue, and they’re super easy to walk in and flattering on your legs with the pointed toe. Second, a denim skirt. I’ve been searching high and low for a good, knee length denim skirt that wasn’t boxy and frumpy. This one, with it’s trendy step hem and fitted, high waisted silhouette is so perfect, and I’m obsessed. Third, a hat. I’ve tried for so long to be a floppy/fedora/wide brim hat person, but honestly I just prefer baseball caps to anything. I love this suede one in light coral — it’s so fresh and pretty for spring, and super comfortable. And fourth, a great spring bag. 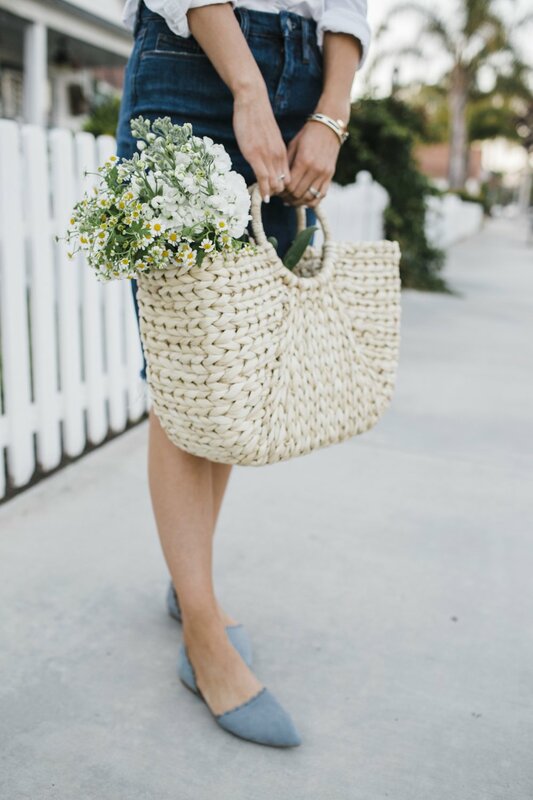 Straw and basket bags are huge for spring, and I love this one. It’s big enough to carry anything and everything I need. But if you’re looking for a smaller one, I love this one too. 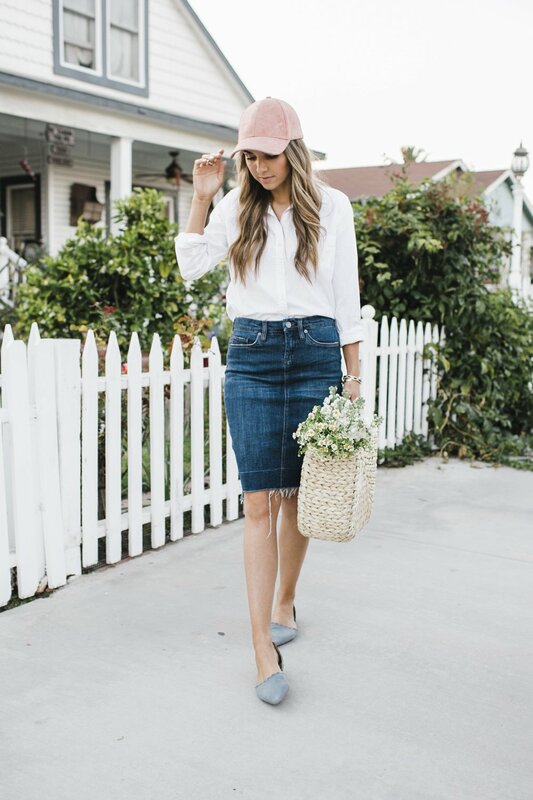 Each of these are pieces you could wear over and over with tons of different outfits, but I love them together to make a simple, classic spring look. Check out Zappos.com for some of the best spring shopping! You’re looking so sweet in this casual outfit! Love your shoes and skirt! I am very flat chested, so I’m able to size down for a perfect fit in the shoulders and arms, without having trouble closing it. If you’re larger chested, it’s probably give and take on which part you’d rather it fit perfectly. But I don’t think I’ve ever worn this jacket zipped up in the front…it looks so great unbuttoned. So I’d probably recommend choosing the size that fits your arms and shoulders. hope that helps! I love that denim pencil skirt! I want to add one to my closet this summer! The skirt runs about a size big and has a good amount of stretch (which makes it super comfy). I typically wear a 26 in BlankNYC jeans, but I’m wearing a 25 in this skirt and it’s a perfect fit. Also the shoes are TTS — I’m wearing my normal size! I love your denim pencil skirt – the longer back is fabulous and so on trend too.